I wanted to write about this, but I’ve never been to Paris. I think Karin said it better than I possibly could. This was heartbreaking news. It was akin to the airplanes crashing into the Twin Towers in New York. Notre Dame is a very old building, in very bad shape, so maybe this was a cry for help as it was slowly falling apart. Hopefully, it can be restored to its former magnificence??? I actually was in NYC on 9/11 and the comparisons did not escape my attention either. However, as there was pure evil involved in one, and devastating loss of life I didn’t draw on that history. I haven’t been able to write about 9/11. Maybe some day. I can say that I was standing at the Brooklyn Heights promenade watching the towers burn with a small crowd. I saw live, not through the lens and production of a camera, humans jumping and the first tower collapse. I will never forget those images. I’m hopeful as well that it can be restored. It’s going to be very, very difficult to restore. Hopefully, there have been pictures taken of every corner of the interior and exterior of the cathedral. That might help them reconstruct much of it. Apparently, this was a horrible, tragic accident but what an awful loss! I used to live in Brooklyn Heights Karin, and from your description, I’m glad I wasn’t there to witness the human suffering of those people desperate enough to take their lives, by jumping, rather than to endure the agony and horror of being burned to death. Take care and write about this when you feel comfortable about doing so. A wonderful tribute to a stunning medieval building. As a medievalist, and someone who appreciates beautiful buildings, I felt bereft watching the flames engulf Notre Dame cathedral. Over 800 years of history up in smoke, and goodness knows what’s happened to the art and relics inside. I only hope they can restore it to its former glory so it can go on for another 800 years. Thank you. I can only imagine your feelings as you surely know more about the building than most. I sincerely hope so. They don’t make craftsmen like the medieval ones any more, but as you say, with luck they may be able to recreate the ‘feeling’ at least. It’s the art and the religious relics I worry about too, because they won’t be able to be replaced. A sad day and a great loss. They won’t be able to fully restore it. We don’t have the stonemasons or carvers they had back then. They had ARMIES of masons. I don’t know if we have any stonemasons who could construct a flying buttress. But they may be able to restore so at least you have a sense of how it was. And hopefully, they have film and video and stills of absolutely everything. These ancient buildings are so fragile. It’s why they are so cautious about restoring them. This is exactly what they fear the most. A little something happens and a magnificent medieval cathedral burns. I never even saw it in person, but I understand what a terrible loss it is and how painful it must be to anyone who has seen and loved it. Indeed, it is a real blow for people that have lived around it and are used to it as a special sacred place and an historical landmark. In York, they have a permanent stonemason’s yard set up, where they’re always working on replacing bits of the minster that need work. But you’re right, it’s only a couple of people and hardly a mason’s army. Wonderful skill to have though, and it’s a shame we don’t see many of these superbly talented people around any more. You must have been an outstanding singer if you were to sing in the Notre Dame cathedral! What a beautiful, touching and highly interesting post this is. Thank You. I can’t say How many times I’ve been in and seen the ND in the years I live now in the Paris region. All our guests and friends have been led there, with them and/or Hero Husband I’ve been for visits, concerts, quiet moments of contemplation (which amazingly always were possible even with all those tourists milling about), moments of pure joy and always wonder to see the beautiful windows, the magnificent doors and statues, the millions of photo opportunities to catch yet another angle of something or other – burned and damaged since yesterday… Only a few hours before the fire I returned to Paris yesterday, taking my ‘local’ train home coming from abroad…. And then this news, only 5’ after the breakout in a newsletter from a Swiss newspaper! Devastating, tremendously sad. 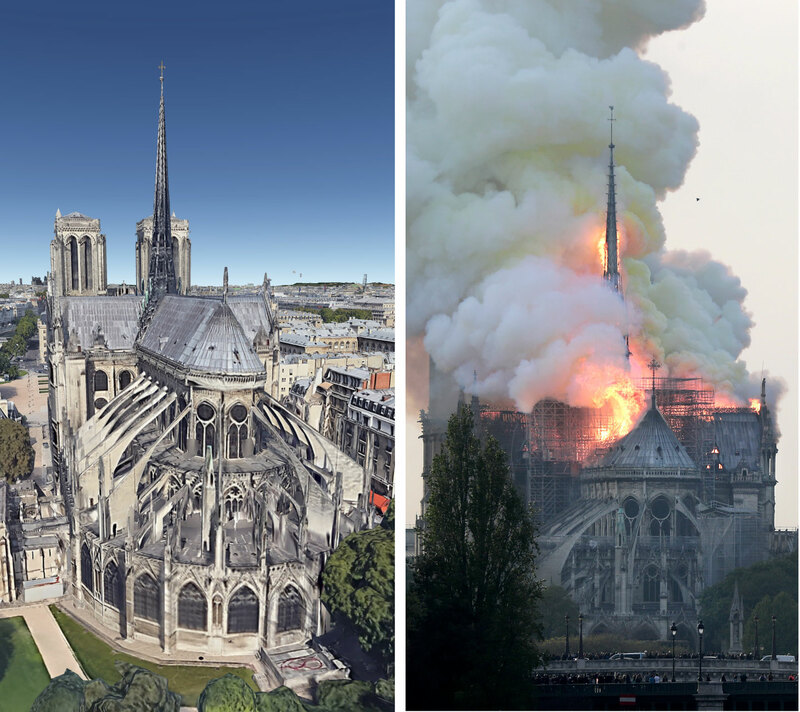 On a more positive note, I am glad to add that already now there is an Investment company, lead by a Familie Pinault, who is donating 100mio € for an immediate rebuild of the damaged cathedral (well part of it, but how quick and generous). Unesco speaker (see: https://www.youtube.com/watch?v=_X8Z390im7Y for info in French) also spreads hope. It is going to cost a LOT of money and it’s also going to take a long time. As I said, I’m not sure we even have stonecutters with that kind of skill these days. Does anyone know how to build a flying buttress? Do we have the materials? A lot of ifs. They can make it “similar,” but you can’t make it what it was which was glorious. Heart breaking, just heart breaking to think we have lost such a beautiful Cathedral. We went to mass there many times. Our numbers were few. I think there were more tourist than parishioners. Thank heavens they saved the alter, the crown of thorns, stained glass windows, and organ. Apparently, they had removed many of the fine art for the restoration. So that is saved too. I am always heartbroken when we lose something that can’t be replaced. Oh, they can do their best and I’m sure they will, but we don’t have medieval stonemasons and all those carvings — who could even do them these days. When we were in India there were some excellent stonemasons still doing work of that caliber. Hopefully they will persevere and rebuild. They are going to be searching the world for the masons they need! It is indeed a tragic loss. The history the beauty the enjoyment. I realize it’s been rebuilt before, but I don’t think it was quite as devastating as this. The money is certainly pouring in to rebuild. Saving these magnificent cathedrals is worth the effort. We couldn’t create one like it today, with all of our machinery. I was thinking the same thing. It really is a tragic loss I can’t get over it. 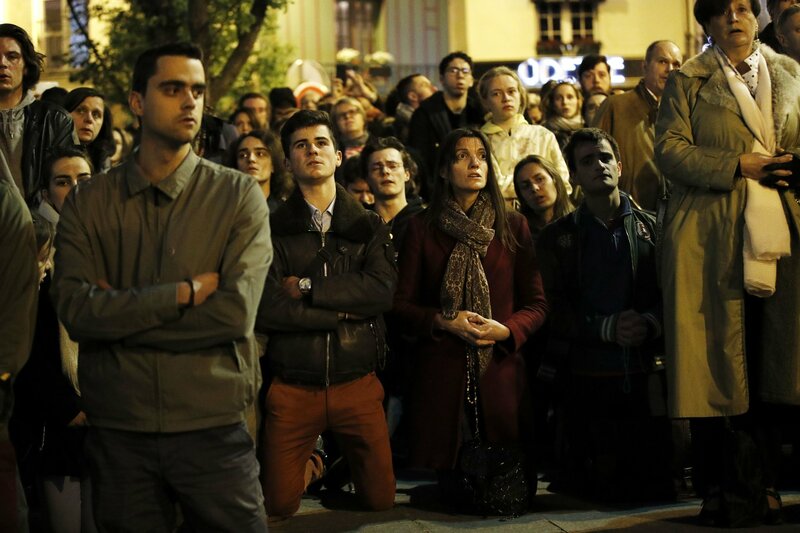 I’m sure Parisians are heartbroken. I will always remember my introduction to Paris as a teenager — crossing the bridge in front of the cathedral with the full moon between (and above) the two towers! 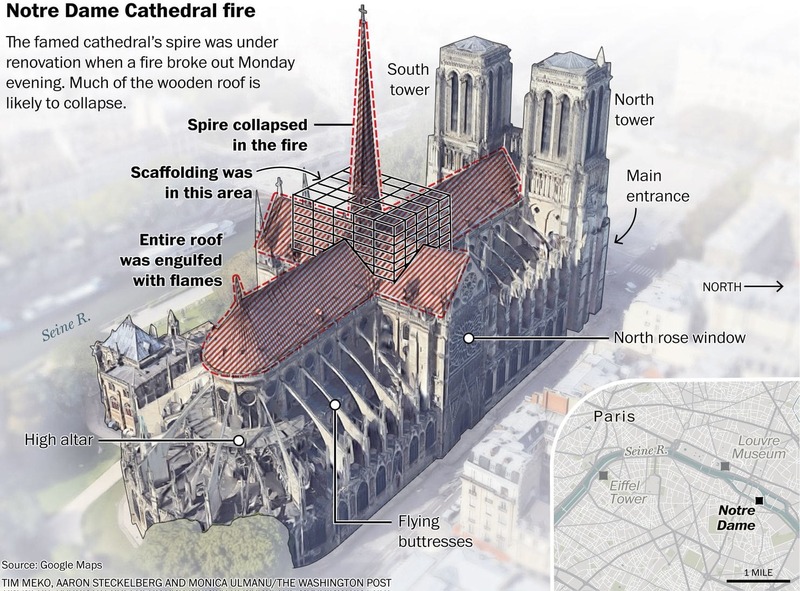 What a tragic incident yesterday, but hopefully it can be reconstructed based on what was saved. I hope so too. These wonderful ancient buildings are markers of our passage through time! I think they will be able to construct something that give a similar “feeling,” but I don’t see how they can really reconstruct it. Does anyone even KNOW how to build a flying buttress?